Click Here– 27% off for .com, work for me on Dec 15, 2018. ₹711.00(≈$10.9) for .com renewal. You can try .net .org and other. currency with inr. 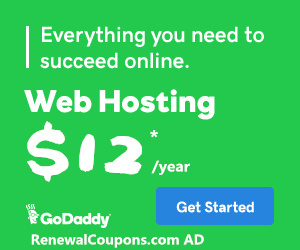 CJCGDHOST8 – $12/year Web Hosting from GoDaddy!+ one free domain. 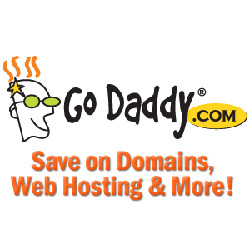 cjc50hst – GoDaddy 50%* OFF ALL New WebHosting Plans in 2019. Note: Just 1 domain for 1 account. Note: Bulk registration for you. Payment method Credit Cards, Alipay, PayPal, UnionPay. cjc1hos5 – $2.49/mo Web Hosting from GoDaddy!+ one free domain. 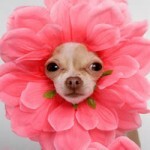 any 30% off coupon for .co renewal? Any active renewal code for domains for .com? Successfully used ACOSKS65 for $10 savings on Hosting renewal. Instead of 2 years, only did one year … same $10 … so I renewed it again! 2 years … $20 savings, by renewing a year at a time.